Thanks to everyone who contributed to a great meeting on January 5th. This meeting is open to all AWSA members. Come find out what’s new in the Eastern Region and let your voice be heard. The meeting is scheduled to start at 9am and will end by 5pm. Hey Officials, Let’s Have Some Fun at Regionals and Nationals! This meeting is open to all AWSA members. Come find out what’s new and let your voice be heard. We were able to secure our traditional location for the weekend of January 5th and 6th, 2019 at the Embassy Suites Valley Forge Hotel, 888 Chesterbrook Blvd, Wayne, PA 19087, (610) 647-6700. This date is consistent with past years. We’ll be sending out another message with all of the details. Please join us at the 2018 Eastern Region General Member meeting on Friday 7/27. The meeting and banquet will be held under the tent on the island at Twin Lakes Water Ski Park in Monroe, NY. 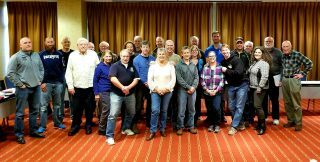 Thank you to the 36 members that attended this years mid-winter meeting. We’ve set the foundation for another excellent year of water skiing fun. Grab a cup of coffee or tea and enjoy some light reading. AWSA EAST is $3983.77 richer due to the 2017 Regionals. Without the profit sharing plan the region would have had ($2775) in expenses and no income from the 2017 Regional tournament due to standard Junior subsidies and Meeting Costs. Click 2017 Regionals Income reconciled for a spreadsheet reconciled to the Regions bank account that was used for the tournament. The end result is a positive $1208.77 in the bank. If you were unable to make the trip. Please join us on your computer, tablet or smartphone. I look forward to seeing everyone at the meeting bright and early at 9:00 AM. Here’s some light reading to get you in the mood!